Papercraft del Planeta Júpiter - Manualidades a Raudales. Maqueta 3D imprimible del planeta Júpiter. Maqueta 3D imprimible y armable del Planeta Júpiter, podéis descargar y ver muchas más manualidades recortables educativas haciendo click Aquí o buscando en los menús superiores en nuestro blog. Esperamos que os sean de utilidad. Júpiter es un cuerpo masivo gaseoso, formado principalmente por hidrógeno y helio, carente de una superficie interior definida. Entre los detalles atmosféricos destacan la Gran mancha roja, un enorme anticiclón situado en las latitudes tropicales del hemisferio sur, la estructura de nubes en bandas oscuras y zonas brillantes, y la dinámica atmosférica global determinada por intensos vientos zonales alternantes en latitud y con velocidades de hasta 140 m/s (504 km/h). Fuente: Wikipedia. Jupiter is the fifth planet from the Sun and the largest planet in the Solar System. It is a giant planet with a mass one-thousandth that of the Sun, but is two and a half times that of all the other planets in the Solar System combined. Jupiter is a gas giant, along with Saturn (Uranus and Neptune are ice giants). 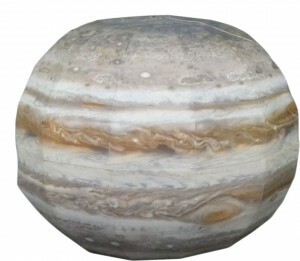 Jupiter was known to astronomers of ancient times. The Romans named it aftertheir god Jupiter. When viewed from Earth, Jupiter can reach an apparent magnitude of −2.94, bright enough to cast shadows, and making it on average the third-brightest object in the night sky after the Moon and Venus. Wikipedia.